The apartment is equipped with a large sofa bed plus a dining table and chairs. The kitchen is fully equipped and includes a dishwasher, oven, hob, fridge, kettle, toaster and Nespresso machine. There is a new shower room with high pressure shower. The price includes Egyptian cotton sheets, luxury bath towels, luxury bathrobes, toiletries, holiday tax and a departure clean. The apartment is a two minute walk to the ski lift and slopes in Le Laisinant. 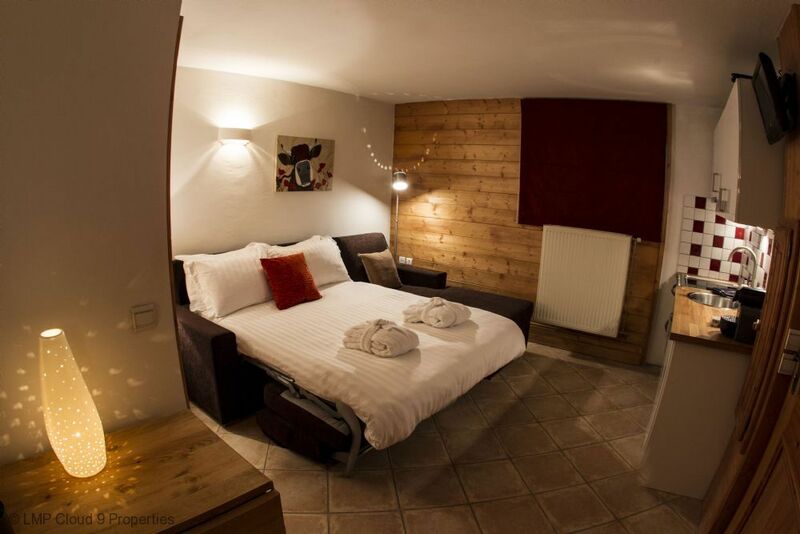 Tarine - A luxury ground floor studio apartment set in the quiet hamlet of Le Laisinant. Tarine sleeps 2 people, with a double pull out sofa.Tarine - Un agreable studio au rez de chaussee dans le Hameau du Laisinant. Tarine 2 couchages, avec un canape-lit. A 22m2 ground floor studio apartment with a sofa bed for sleeping. Sleeps 2 people. To secure the rental a 25% deposit is required within 5 days of booking. The balance is due 60 days before arrival.